Seems like Virginia turned into Florida these afternoons–hot and sunny all day until 3 pm and then, bam, massive storm rolling in from Ohio or somewhere west of us. Fun to watch the sky change to quickly, listen to the weather reporters have little freak out sessions. And still I’d guess that over 50% of folks here don’t “believe” in climate change. Sorry, you guys, but the record high temperatures and freak storms might indicate otherwise… Oh, so it goes, I guess. All the stormy weather turned my thoughts toward a mishmash of summer and fall. Or cooler, rainy days at least. And while it may not have been very chilly outside of the A/C (anyone else wear a sweater to work because the A/C is so low? Ridiculous! ), the ever-present zucchini and one leftover yellow squash (why oh why did we ever buy squash at the farmers market? Didn’t we know we’d be swimming in our own not long after?) begged to be made into a ratatouille of sorts. Even better, I remembered Monica’s bulgur & pesto stuffed mushrooms and knew that I wanted to stuff whatever I came up with into a portobello cap and bake it. It’s been forever since I’ve eaten a stuffed mushroom, was time to rectify that. This isn’t really food that you want to eat to cool you down–it’s warming and somehow rich, but with all the summer produce lying around, it makes sense. My mushroom envy hasn’t subsided (Monica foraged her mushrooms), but at least portobellos are easy enough to come by at the grocery store here. The dish was also an exercise in making something without a recipe–something I rarely do. Even now, years after beginning to cook, I mostly veganize a non-vegan recipe or do a riff on something published. While I’m sure this combination is nothing new, I’d like to think I created it, feels a little more genuine somehow. Compared to the last dish, this one is fairly easy to make–canned tomato sauce, squash and eggplant, lentils, portobellos. Perfect for whipping up on a weeknight when you want something that feels a little more special (stir-frys get old sometimes). I served mine with mashed potatoes and a local lettuce salad with a simple vinaigrette (what it was, I’m not sure, but I’m guessing oil, champagne vinegar, capers, and lemon) and a glass of red wine (boxed wine for the win!). They also reheated perfectly for lunch the next day–just remember a knife if you take yours to work! In a small sauce pot, bring the lentils and enough water to cover them by two inches to a boil. Lower to a simmer and cook 15-20 minutes until soft. Drain and set aside. Meanwhile, pre-heat the oven to 400 degrees Fahrenheit. Clean the mushrooms and carve out the thick stem end, being careful not cut through the other side of the mushroom. Set aside. In a heavy bottomed pot (I used a Dutch oven), warm 2 tbsp olive oil over medium heat. Add the onion slivers and saute for 4-5 minutes, until translucent. Add the garlic and cook 1 minute more, until fragrant. Add the half pint of tomato sauce and the cooked lentils, and stir to combine. Remove from heat and set aside. With a pastry brush or your fingers (confession: I use my fingers), spread a thin coat of olive oil over the tops and bottoms of the mushrooms. Place on a parchment lined baking sheet and fill with the vegetable mixture. Bake for 15 minutes, until the mushroom is soft when poked with a fork. Remove, let cool for 5 minutes, and serve. Yay, stuffed mushrooms! And another way to eat as much zucchini as possible–very nice. I should make a bunch of these and stick them in the freezer for zero-effort lunches. That looks incredible! Such a good idea, Thanks for sharing! Holy moly – you’ve turned the tables on inspiration cuz now I wanna try THIS. Love the big chunky chunks of zucchini. Looks delicious…as long as I pretend the mushroom is a bell pepper! And yeah, I have actually had to turn my space heater on at work at times because the A/C is so cold. Haven’t done it recently because the thought of all that electricity being used makes me sick, but I’m often colder in the office when it’s 100 degrees out than I am the winter. 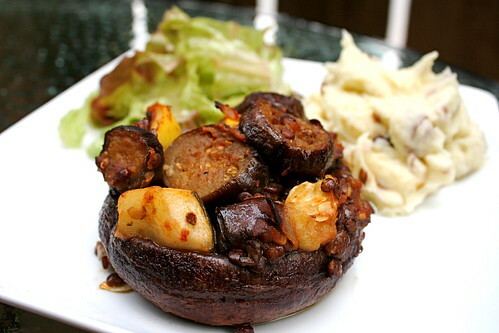 I plan on getting some more portobello mushrooms from the Union Square Greenmarket tomorrow. This looks like a tasty meal. Thanks!